David Bowie and his army of six-string co-conspirators had more than their fair share of fine guitar moments. Here we take a look at three fan favourites and discuss the subtleties required to nail them authentically. This is a simple lick, but it is worth taking a look at your technique to make sure you're playing it as well as you can. First of all, you'll need solid timing on the opening four notes (A-A-A-G) and this comes down to a steady picking motion. We recommend repeating the phrase with a metronome or drum loop at a slightly slower tempo. The string bend from A to Bb is crucial - hit the wrong pitch and you'll sound out of tune. This happens when your finger isn't strong enough, so use two fingers to bend the string. For the pull-off the challenge lies in sounding the open string without colliding with another string. Practise slowly and adjust the angle of your pull-off as necessary. 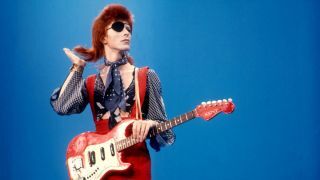 It's not immediately obvious but the riff from Rebel Rebel is based around three easy open chords: D, A and E, and that means there are no great surprises as far as your fingers are concerned. Sure, there are some variations: an open first string on the D chord makes it a Dsus2 and the 2nd fret C# note added to the E implies an E6 chord, but these are easy changes. The challenge comes with the picking, or, more specifically, playing certain notes from each chord, so you'll need to to keep pick hand movements as small and controlled as possible. There are subtle variations to the riff throughout the track but we recommend learning it in its simplest form and adding your own ideas. The rhythms in this Nile Rodgers-penned riff sound highly complex, but, in fact, each chord is strummed just three times. The intricate rhythms are produced by a dual delay effect, one set to an eighth note pulse (263ms) and the other to a quarter note (526ms). If you have a stereo setup pan each delay about 50 per cent to either side for an expansive sound. Your timing must be spot on because any mis-timed hits will completely throw you off as you hear the delayed repeats. The three chord strikes fall on beat 1, the fourth 16th note of beat 1, and on beat 3. We advise 'ghost' strumming a 'four notes per beat' rhythm, only making contact with the strings on the three strums. TIP: Set your delay to a low feedback setting. Any more than three or four repeats and you'll be awash!